(From Amazon) This stunning debut captures the grotesque madness of a mystical under-land, as well as a girl’s pangs of first love and independence. Alyssa Gardner hears the whispers of bugs and flowers—precisely the affliction that landed her mother in a mental hospital years before. This family curse stretches back to her ancestor Alice Liddell, the real-life inspiration for Lewis Carroll’s Alice’s Adventures in Wonderland. Alyssa might be crazy, but she manages to keep it together. For now. This book was so amazing in so many ways, I don’t even know where to begin. The writing was beautiful, vivid and descriptive, the characters came alive, and the plot intrigued me from the very beginning. I’ve always loved Alice and Wonderland, and this was a captivating tale, set in the world of Wonderland, with a dark twist on the beloved children’s story. The references to The Crow and Labyrinth won my heart. My favorite part of the story was Morpheus. I can’t help it – I’m totally fangirling over him! Basically, he’s Brandon Lee as The Crow + Jareth from Labyrinth + a Dark Angel + Captain Jack Sparrow + The Phantom of The Opera. So… any more questions? I pretty much swooned over him the entire book, so I’m not going to say anything else, or my review will be 100% Morpheus-focused. While I’m sort of on the subject, I really loved the character names in this book. Persephone, Morpheus, Aphrodite, Adonis. I’m a big fan of Greek Mythology – well, mythology in general, to be honest – so I loved this. Howard did a great job twisting the names of the Wonderland characters, as well, to make them fit this darker, scarier version of a place only a child could have dreamed up. Rabid White? Herman Hattington? Chessie? All great twists on classic characters, and the logic behind the Lewis Carroll version vs what Alyssa sees (as explained on page 104) is great. As for Jeb… I know a lot of people loved him, and don’t get me wrong, I do, too. But there were a few instances when he kind of annoyed me, like when he took Taelor’s word over Alyssa’s and when he demanded she not trust Morpheus, but he trusted Gossamer. These things just rubbed me the wrong way, and kind of reminded me of Jay from The Body Finder series, and I wasn’t his biggest fan. But Jeb had some redeeming qualities. First of all, he’s worthy of some swooning, too! And he really put his life on the line for Alyssa several times throughout the book. I nearly cried a few times. This is a random thought, but did anyone else think the bickering between Jeb and Morpheus was reminiscent of Xander and Angel from Buffy the Vampire Slayer? Was it just me? There were some great twists and revelations in the last 100 pages or so, some things I had started to figure out, and some that came as a complete shock. There was a lot of screaming and crying, to be honest… And the last paragraph was just.. sweet and romantic and tear-inducing. Overall, if you couldn’t tell already, I adored this book so, so much. I have no clue how I’m going to make it January for the next book! 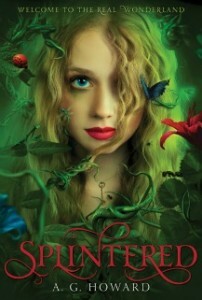 I loved Splintered too!! It was awesome-sauce!! And I’m kinda neutral with Jeb and Morpheus :P Though I do see where you’re coming from for both characters but HOW DO YOU NOT LIKE JAY :O I loved that guy!! Anywhoooo fantastic review! Haha I’m so glad you enjoyed Splintered! Morpheus is such an awesome character and I can’t wait to see what will happen in book 2. I honestly don’t know what’s going to happen because the story is kind of unpredictable. The answer for your question on how you’re going to wait till January…. REQUEST THE CHAPTER SAMPLER OF UNHINGED ON NETGALLEY :P well, if you haven’t. But those sampler things are such teasers! I’ll probably just wait. Morpheus!! -Fangirls… Dies.- Haha. Oooooh, that chapter sampler is SO tempting, but then I KNOW it’ll make me want the whole thing RIGHT NOW and the wait will feel even longer. I think I just need to try – somehow – to wait patiently!